On the Clients page there is a list of your agency's clients that place banner ads on Yandex. If you want to plan an advertising campaign for a client that is not in the list, click +Create. Select your agency name from the list. Enter your client's email address and their website URL. 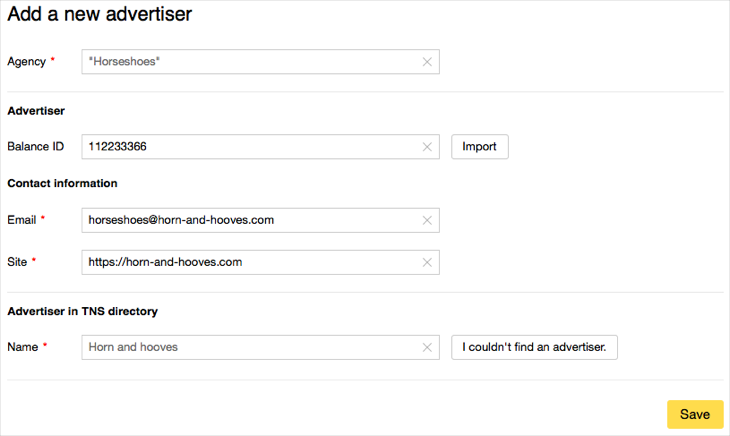 In the Advertiser in TNS directory section, start typing the name of the advertiser, and then select it from the list of suggestions. Click I couldn't find an advertiser. Enter the name of the advertiser and select the most appropriate category. You can also enter the brand name. The advertiser's status will be “Awaiting moderation” and the information you added will be sent for moderation. The moderator will check if the advertiser is new or has already posted ads on Yandex and enter them into the database if necessary. When this happens, the advertiser's status will change to “Confirmed” and you can create an advertising campaign for them. If any inconsistencies are discovered during moderation, the advertiser's status will change to “Rejected”.